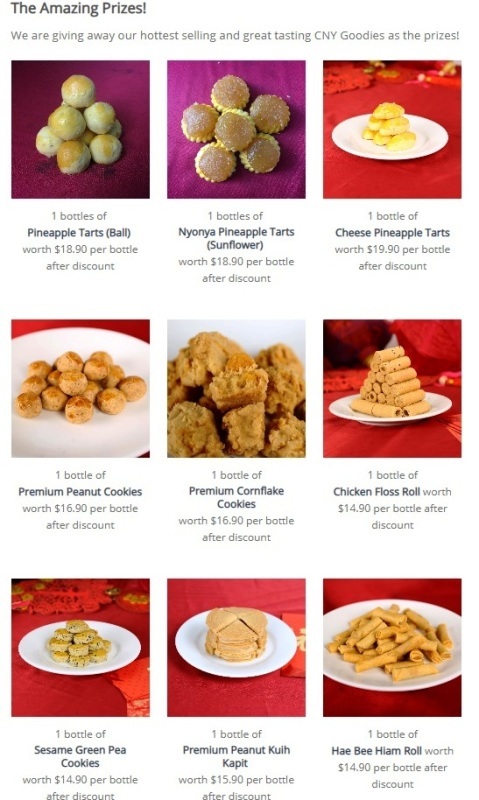 You are here:Home » Product Reviews » Homemade CNY Goodies Bing Liang Bakery Giveaway Worth $150 x 3! We tried all 3 Pineapple Tarts – Cheese Pineapple Tarts ( SGD 29.90 ), Nyonya Pineapple Tarts ( SGD 28.90 ), and Pineapple Tarts - Ball ( SGD 28.90 ). My family does not have sweet tooth, and we don’t like snacks that are overly sweet. 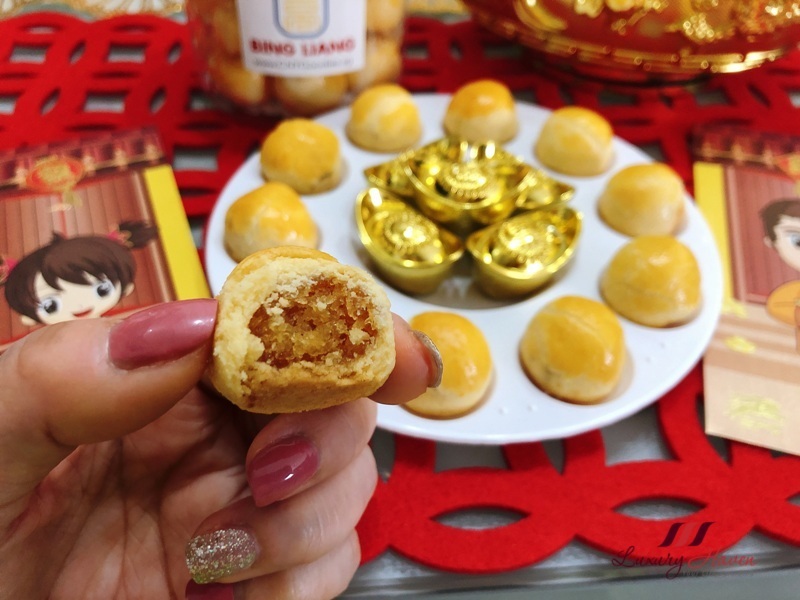 We love the fact that all their Pineapple Tarts are made using Top Grade Golden Butter. The tarts have a sourish tang and the pastries have that soft and flaky texture that melts in your mouth. However, we would prefer a stronger and cheesy taste for the Cheese Pineapple Tarts being cheese lovers. As for the Nyonya ones, gotta admit they are not very good-looking being handmade, hence I do not recommend if you are giving them away as gifts. Hence, our top pick goes to the Pineapple Tarts ( Ball ), where you can joyfully pop these tasty treats filled with moist pineapple jam into your mouth! Premium Peanut Cookies ( SGD 29.90 ). Made from the finest ingredients, these hot sellers gotta be the best we have ever tasted. Soft and buttery, these savoury sweet Peanut Cookies easily melt in your mouth and they are highly addictive! Bamboo Kuih Kapit ( SGD 24.90 ). Popularly known as Love Letters or Semprong /Sepit, these coconut-flavoured traditional wafer snacks are a common sight during the CNY festive period. These egg rolls have slowly evolved into fanciful triangular shapes with more new flavours as this Bamboo Kuih Kapit by Bing Liang. The container has a mix of the traditional golden brown as well as black wafers prepared by adding bamboo powder, and preparing it over charcoal fire. These waffle-thin egg rolls with sesame seeds are so fragrant, you can almost smell it the minute you take your first bite! Crispy Pumpkin Seed Cracker ( SGD 28.90 ). While Crispy Almond Crackers are commonly seen, these Crispy Pumpkin Seed Crackers are rather unique. Loaded with the goodness of pumpkin seeds, you can merrily snack these Crispy Pumpkin Seed Crackers this CNY without feeling too guilty. Hae Bee Hiam Roll aka Sambal Prawn Cracker ( SGD 19.90 ). I am a sucker for these spicy prawn rolls, so I can be a bit biased. It is just one of those snacks I gotta have for Chinese New Year. What about you? This Lunar New Year, followers of Luxury Haven will get to shop at Bing Liang Bakery with a 25% Discount for a limited time only! Simply key in the Promo Code: luxuryhaven25 during checkout! * Minimum spending of SGD 88 with Free Delivery service! So start shopping for your Chinese New Year Goodies now! * Free tasting is available at their Jln Pemimpin outlet. Now, for the Giveaway! 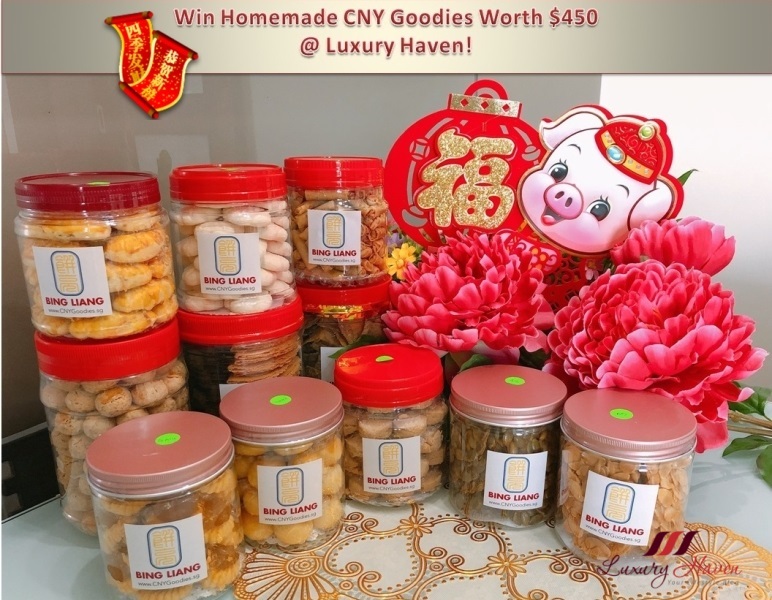 3 lucky readers of Luxury Haven will receive SGD 150 Worth of Bing Liang Homemade CNY Goodies each this Chinese New Year! Isn’t it awesome? But don’t blame us if you put on weight! Simply tell us Which is your favourite CNY snack! Complete all the steps in the Rafflecopter widget below to qualify for the draw. Giveaway is from Jan 15 - 25. 3 readers who have completed all steps will be randomly selected via the Rafflecopter widget. * This is a sponsored post by Bing Liang Bakery. The author only recommends products or services she uses personally which she believes to be beneficial for her readers. Views and opinions expressed in this blog are purely by the author. Pineapple tarts for sure... Especially those melt in ur mouth covered ones! My pick is the pineapple tarts. It is hard to choose between Pineapple Tart, Kueh Bangkit, Hae Bee Hiam Roll... but my favourite will be Kueh Bangkit! Wah....I love these CNY treats! This is the time to forget about dieting. LOL! My favourite CNY food is pineapple tart ��. Its so wonderful I can eat pinapple tart at during cny celebration with my family. It’s a great chance for bonding with loved ones. ❤ Lots of luck for this pig year. Such a generous giveaway! Good luck to all who enter! These look yummy. Good luck to all participants. I love how generous Luxury haven has set this up with Bing Liang Giving is the best new year choice of awesome bakes to everyone. Thank you so much happy new year. My favorite cny goodies is definitely pineapple tarts!! Hope to win this awesome giveaway to share with my family! I love 蜂巢饼! Like and shared! I may have missed out the place to indicate my favourite CNY goodies. My all time favourite is none other than pineapple tarts which is not so sweet, with a slight sour pineapple fillings and melt in your mouth tart! Chloe Lim Wynden Lim Chris Lim come and check this out! Those pineapple tarts and pumpkin seed crackers look delicious. Make sure you have a handful for me Shirley hahaha! Good luck to everyone entering. This is an awesome giveaway. Looks like the pineapple tarts taste really good. My favourite CNY snacks is pineapple tarts. This giveaway really makes want to reside in Singapore! Fab goodies! Pineapple Tart, Almond Cookies, Crispy Pumpkin Seed Cracker, Crispy Almond Seed Cracker all my favourite CNY snacks. Pineapple Tart, Almond Cookies, Crispy Pumpkin Seed Cracker, Crispy Almond Seed Cracker all my favourite snacks . Pineapple Tarts is my all time first love !